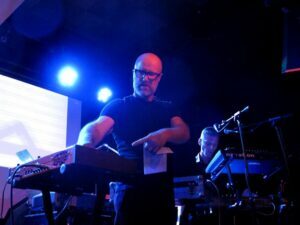 Following the success of ‘An Evening With The Swedish Synth’ in March 2014, Nordic friendly blog Cold War Night Life presented ‘A Secret Wish’, No2 in their occasional live series at The Lexington in London. As with many quality events, it was attended by luminaries from the music scene. 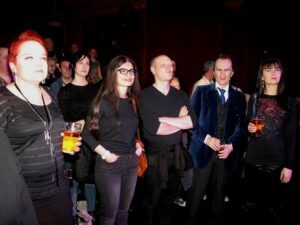 Among those present were DUBSTAR’s Sarah Blackwood and Jonathan Barnbrook, the designer whose artwork has adorned recent releases by DAVID BOWIE, JOHN FOXX and HANNAH PEEL. The audience had an international flavour too, with attendees coming from Norway, Sweden, Finland, Italy, France and the United States. 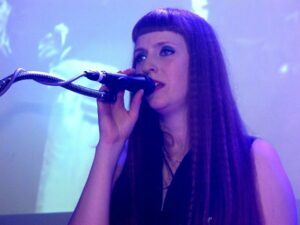 While not wholly Swedish in line-up this time round, there was a definite Scandinavian slant with Swedish synth veterans SISTA MANNEN PÅ JORDEN making their debut UK appearance and the now Norwegian based studio legend JOHN FRYER spinning a variety of music from his illustrious career. Representing the home crowd were VILE ELECTRODES, now more than fully established as the UK’s best independent synth exponents. 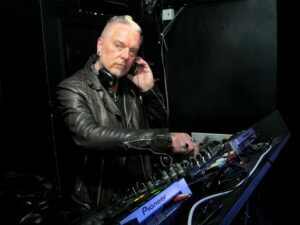 JOHN FRYER cut his teeth with Daniel Miller and Eric Radcliffe at the legendary Blackwing Studios and his opening DJ set covered his wide ranging work for the 4AD and Mute labels. With live enhancements, this included FAD GADGET’s ‘Back To Nature’, MODERN ENGLISH’s love song to accompany the nuclear apocalypse ‘I Melt With You’, M/A/R/R/S ‘Pump Up The Volume’, COCTEAU TWINS ‘Sugar Hiccup’ and the first DEPECHE MODE single ‘Dreaming Of Me’. 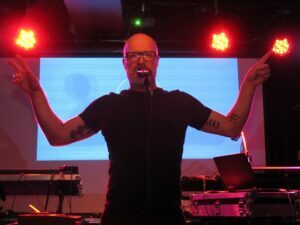 In an exclusive UK performance, Sweden’s SISTA MANNEN PÅ JORDEN (SMPJ – translated as “The Last Man on Earth”) gave an energetic performance that showed why they have been a cult live attraction in Sweden. Led by Eddie Bengtsson, best known for his work with S.P.O.C.K. and PAGE, he was accompanied by his faithful sideman by Christer Hermodsson. Opening with the steadily building ‘Leonov’, a tribute to the Cosmonaut who was the first man to walk in space, the spacey floating vibe more than fitted in with SMPJ’s regular space travel and Sci-Fi themes. ‘Stanna Kvar’ followed and was a wonderfully immediate slice of melodic synthpop in the Vince Clarke vein, while last year’s single ‘Stadens Alla Ljus’ continued the enjoyable momentum. While all of SMPJ’s songs are voiced “i Svenska”, Eddie Bengtsson was game enough to sing a few choruses in English. ‘All The City Lights’ from the new ‘Translate’ EP was a particular highlight; “Are you impressed?” joked Eddie while glancing at his hand scribed lyric sheet. Bengtsson’s intense but charming personality certainly won the audience over as he led the odd ad-libed singalong and even joined the crowd down on the main floor. The swung Schaffel of ‘Vem Gör Det Då’ gave some rhythmical variation, but there was one brilliant surprise towards the end of the set. It was what Bengstsson referred to as SMPJ’s “ULTRAVOX tribute” and it came in the form of ‘Allt Är Klart’ , effectively a Swedish vocal version of their instrumental B-side ‘Alles Klar’. The hard, staccato synth bassline remained from the original, but the track was bolstered by a superb whirring solo from Hermodsson firmly in the ARP Odyssey tradition. Climaxing ‘A Secret Wish’ were VILE ELECTRODES who played a fair percentage of fresh new material to give a taste of their much anticipated second album. The mesmerising new single ‘Captive In Symmetry’ with its nod towards ‘Twin Peaks’ sounded sublime. Meanwhile, ‘Last Of The Lovers’ pointed towards the dreamy, but danceable Nordic soundscapes of RÖYKSOPP. Live favourites ‘Empire Of Wolves’, ‘Damaged Software’ and ‘Proximity’ provided everyone with some references of familiarity, but the funereal ‘Dead Feed’ proved that Anais Neon and Martin Swan could do unsettling experimentation too. The old new number ‘Real 2 Reel Love’ closed proceedings, having been reworked from its original sub-NEW ORDER disco incarnation into a much darker, more progressive proposition. Some observers at ‘A Secret Wish’ questioned whether VILE ELECTRODES were adding anything new to electronic pop, yet failed to state any examples of what could be considered progress in the genre. While VILE ELECTRODES may not be playing with ethereal dubstep and glitch techniques like PURITY RING, what Neon and The Swan do produce are memorable songs presented in an artistic, yet accessible manner. In fact, the line-up of JOHN FRYER, SMPJ and VILE ELECTRODES at ‘A Secret Wish’ had a common thread running through ie good tunes. No matter that Elizabeth Fraser sounds like she’s invented her own language, Eddie Bengtsson rants in Swedish or Anais Neon intonates with a very English Home Counties accent… there is intuitive melody and soul. 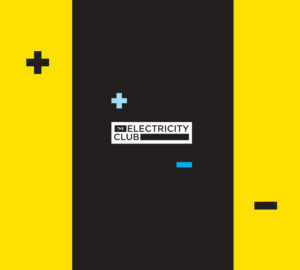 Now if melody and soul is what’s making modern electronic pop music sound old-fashioned, then great; The Electricity Club and no doubt Cold War Night Life would like to have some more of that! Cold War Night Life recently coined the term poptronica to describe VILE ELECTRODES and SMPJ. With the dedication and care that they have taken in their live projects, what they have proved is that the best electronic music events are those curated by genuine electronic music enthusiasts.